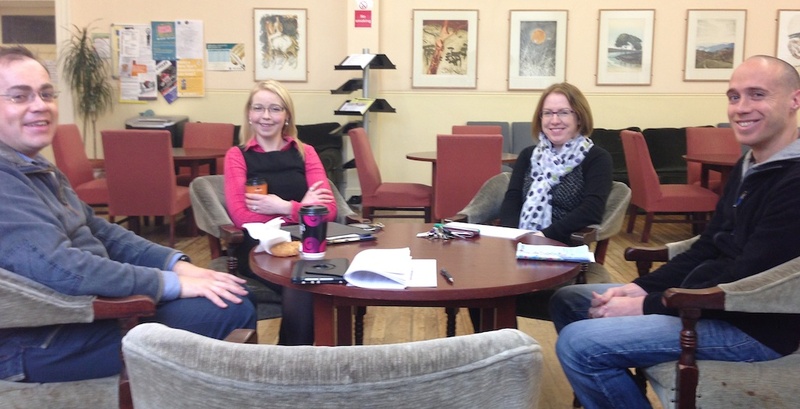 Meeting with John McGrory, Fionnuala Farrell, Una Beagon, and Ted Burke to discuss teaching design. What does a skilled designer do? How does she act? How does he know what will work? My colleagues at Dublin Institute of Technology and I want to know. We all have design and teaching experience. We have a feel for what good design practice looks like. But we aim to be more precise. We want to explain this well to our students. So a group of us — who are teaching design on the new “common first year” course that all engineering students in DIT’s four year honors engineering program are now taking — got together Wednesday morning to mull it over. Before meeting, we all read an excellent and comprehensive article by David Crismond and Robin Adams that was published in the Journal of Engineering Education. It is called The Informed Design Teaching and Learning Matrix and can be purchased from Wiley. When we got together, we first introduced ourselves (three of us are fairly new to DIT, two are quite experienced here). Then we talked about how our three different project modules are structured. After Ted Burke expressed interest in Crismond’s rubric, and I saw Fionnuala Farrell using techniques recommended in a paper by Crismond and Adams, I decided it was time to read the paper in full. I emailed it out to my colleagues and asked them to come discuss it. Una Beagon is teaching bridge design. She’s a civil engineer. John McGrory and Ted Burke are teaching RoboSumo. They are electrical and electronic engineers. Fionnualla Farrell is a product design and manufacturing engineer. She coordinates the Energy Cube module I’ve been assisting with. When we met, I distributed a rubric Crismond shared at the 2008 National Conference on the Beginning Design Student. The rubric is very helpful for identifying and describing effective design behavior. Years ago, Dr. Crismond was gracious enough to let me include his rubric in two articles I published for educational planners and architects (Iterative Approaches to Planning and Strategizing: Learning from the Architectural Studio Model and Strategic by Design: Iterative Approaches to Educational Planning for sale by SCUP). I also integrated parts of it into a new Rubric for Assessing Epistemological Understanding of Students who are Learning Design. The paper we read has a similar, but more elaborate rubric. Both are very helpful in defining design prowess. There’s also a version to help teachers do quick assessment of student’s design development. I meant to publish this on Ireland by Chance, but it ended up on RoboSlam. I think it’s quite at home here too!